Celebrating the life and in memory of Mark McMurray (1986-2007) ten year anniversary with all proceeds going to The Christie Young Oncology Unit, Manchester. 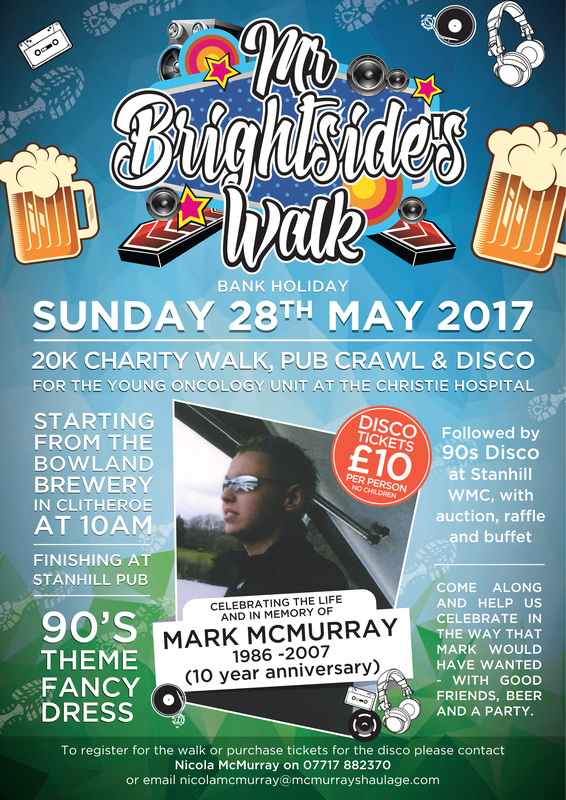 Mr Brightside Walk taking place bank holiday Sunday 28th May 2017 we are hoping as many people as possible join us to celebrate, laugh and raise money for this great cause the way Mark would have wanted. 20k walk/pub crawl - starting at The Bowland Brewery, Clitheroe at 10:00 am walking to The Stanhill Pub, Oswaldtwistle. 90's fancy dress theme. The walk is open to everybody and the more the merrier but please register so we can have an idea on numbers. Disco - Tickets £10 per person. Adults only 90s disco with a raffle, auction and buffet with all proceeds going to The Young Oncology Unit. Continue the fun from the walk into the night. Tickets available by contacting Nicola as above. If you would like to help support us with this fantastic event sponsorship forms for the walk available upon request or alternatively we are looking for raffle and auction prizes and all donations are welcome.